Each year the KBS LTER awards full and summer fellowships to MSU graduate students. MSU graduate researcher Susan Magnoli is a PhD student in Jen Lau’s lab in the Department of Plant Biology. She wrote about her 2017 KBS LTER summer fellowship project. When you think about studies of evolutionary biology, images of Darwin’s finches, diverse fish communities, or beautiful tropical forests might come to mind. But what about agricultural landscapes? While they at first might not appear to be the most exciting habitats, the farm fields and biofuel crops of the Kellogg Biological Station Long-term Ecological Research site (KBS LTER) are actually a great place to study evolution, because we can track the growth of known populations over relatively long periods of time. Susan Magnoli in a LTER abandoned field with Chamaecrista fasciculata. As an evolutionary ecologist, I study the role of rapid adaptation (adaptation that occurs on a timescale observable by humans) in plant population establishment. Evolutionary theory has long predicted that if a colonizing population can rapidly adapt to the conditions of a new habitat, it is more likely to successfully establish. However, there is little evidence from field studies to show that this actually happens. To determine whether rapid adaptation has occurred, individuals in an established population must be compared to the initial colonizers from which the population was formed, which is rarely feasible to do in the wild. Luckily, the GLBRC (Great Lakes Bioenergy Research Center) scale-up experiment was set up in such a way that makes this possible. 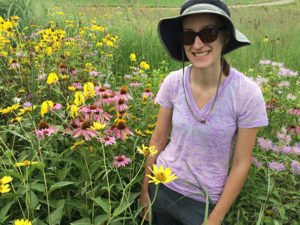 Given the replicated, fully established scale-up prairies and the fact that seeds were saved from their original plantings, the GLBRC scale-up experiment provides a unique opportunity to study rapid adaptation in established plant populations. As an LTER fellow, I began experiments to determine whether plant populations in the GLBRC have rapidly adapted, and whether this adaptation influenced population establishment, in the summer of 2016. I used populations of the annual legume Chamaecrista fasciculata (partridge pea), growing in the scale-up prairies at Lux Arbor and Marshall Farm. The populations were established in 2010 when the prairies were restored, and seeds were saved from the original planting. I grew seeds from both the Lux Arbor and Marshall populations, and seeds from the original source, at both prairie sites. I measured plant traits (such as flowering time and height) to see if the two established populations differ from their original source, which would indicate that they have evolved in the six years since they had been planted. I also measured natural selection on these traits, by determining whether there is a correlation between plant traits and plant fitness (e.g., do plants that flower earlier produce more seeds, or do taller plants produce more seeds) to determine whether evolved trait changes are adaptive. Chamaecrista fasciculata (Partridge Pea) in flower. I found that Chamaecrista populations do appear to have evolved in the six years since they were established. The populations at Lux Arbor and Marshall both flower earlier than the original source population, and the Lux population makes more root nodules (structures that house mutualistic nitrogen-fixing bacteria) and have different leaf area to weight ratios than the original source. 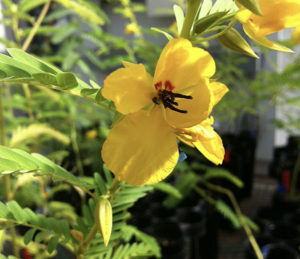 Measures of natural selection suggest that some of these evolved changes are adaptive (i.e., flowering earlier appears to lead to higher seed production). I am excited by these results, because six years is a short timescale over which to find evidence of evolution in plants. I am continuing my research in this system to determine whether this evolution actually matters in terms of population establishment. The results of an ongoing study will show whether evolution in these populations increases population growth rates, which would increase the likelihood of successful population establishment. The more we know about the mechanisms underlying successful population establishment, the better we will be able to restore plant populations in degraded habitats. This is especially important as we try to increase biodiversity in our landscapes.